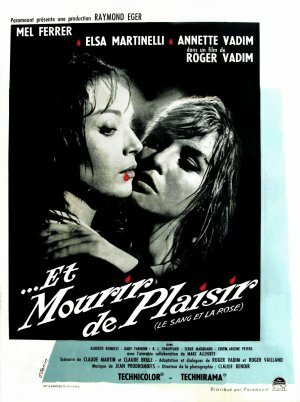 Blood and Roses, or Et mourir de plaisir, is one of those movies I have know about for years and I have always wanted to see. Well I found it on Amazon Instant Video and thought this was a good of time as any. After dealing with The Twins of Evil earlier in this challenge I have to admit my hopes for this one were low. Well this one certainly has it's moments, even if it is a touch slow. I was thinking if it were redone today the narration would have been dropped. This movie takes place in the modern day and plays a little like a sequel to the Vampire Lovers, with Twins of Evil as a prequel. This one though introduces a male lover for Carmilla/Millarca which will have any long time reader to this blog scratching their head like me. The movie though is good. The lesbianism is as underplayed as the vampirism. This easily could be about a girl going crazy because the man she loves is marrying someone else. It is only at the end is their a supernatural (maybe) twist. I now think I have seen all the film adaptations of Carmilla, but it is possible that one is still out there.